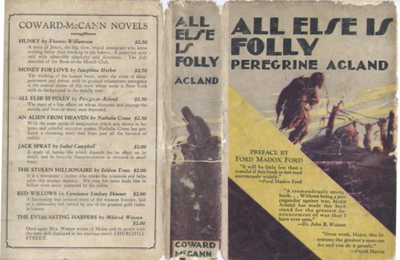 James Calhoun has started a promising blog on the Canadian novelist Peregrine Acland, author of the war novel All Else is Folly (1929). Acland wrote a thirteen stanza poem called “The Reveille of Romance” while on the troopship bound for England in the fall of ’14. It was subsequently published in several newspapers, government journals, and a small press run chapbook was produced (by his sister, I believe) and passed out to friends. It’s not very good, but it’s short –full of grand notions and youthful idealism –you know the type. What I find interesting is Acland revised the poem quite extensively when he was convalescing in hospital in ’17, after his horrific wounds on the Somme. He added an element of doubt to the poem, a first hand knowledge of battle and what it does to men; though still not a great poem (or even a particularly good one) it’s far better than his original version. My question to you is, can you think of any other examples of war poems that were revised/re-written over the course of the war, where the first edition was all youthful enthusiasm and the second was informed by bitter experience? All of the examples of revision I can think of are minor changes to a line, rather than a completely revamped poem under the same name. I don’t think I can think of an example. Any ideas? Ford Madox Ford’s preface to All Else is Folly is maybe interesting in the light of the current TV version of Parade’s End. He praises Acland’s novel for containing a hero ‘as normal in temperament and circumstances as it is possible to be’, on the grounds that a ‘normal’ hero who is ‘neither hypersensitized nor callous; neither Adonis nor Caliban; neither illiterate nor of the intelligentsia’ will be identified with by ‘normal’ readers. I wonder how many of the audience Benedict Cumberbatch will carry through to the last episode. Acland was good at getting the famous to endorse him. Not only did he persuade Ford to write his preface, but, as James Calhoun points out, he rather cheekily got publicity quotes for his novel from eminennt persons as diametrically opposed in their views as Bertrand Russell, the militant pacifist, and Robert Borden (Canada’s Prime Minister during the War). As Calhoun points out, Acland had been in advertising, and clearly had strong ideas about how to push a product. This entry was written by George Simmers and posted on September 10, 2012 at 12:01 pm and filed under novels. Bookmark the permalink. Follow any comments here with the RSS feed for this post. Post a comment or leave a trackback: Trackback URL. Sassoon’s ‘Brother Lead and Sister Steel’ is a poem that was both unchanged and completely revamped- a Borgesian idea. According to Robert Graves it was sincere when Sassoon wrote it and republished as satire.